On September 3rd, the Broom Hilda comic strip by Russell Myers summarized the qualifications of our most beloved politicians in just a few words. Of course, such popularity is expensive. So how do politicians pay the bill? They charge it! At every level of our government, politicians give away free stuff. In Prince William County, our leaders frequently build roads for developers. That is, they build a road that almost nobody uses until houses spring up all around it. That’s suppose to be the state of Virginia’s job (Please note the sarcasm. ), but our governor and General Assembly doesn’t seem to mind if our Board of Supervisors supplements their spending. Well, maybe they do. They did manage to concoct a tax bill that hits the residents of Northern Virginia and Hampton Roads especially hard (see McDonnell changes essentially keep transportation, Medicaid deals intact and Virginia Governor Bob McDonnell’s Transportation Tax Hike Takes Effect Today). More ridiculous spending than what is generally found in Virginia occurs in other states. Consider this article, Generous teacher pensions continue as Illinois’ financial crisis worsens, for example. That article explains how Illinois is going bankrupt trying to pay the pensions of its teachers. Congress, however, outrageously outspends state and local governments. Congress pours most Federal Spending into Social Security and health, education, and welfare programs. Why the huge spending? Perhaps it helps that the Federal Government can print money so it borrows more readily (see No Surprise, Fed Was Biggest Buyer of Treasuries in 2013). Unfortunately, whether we like it or not, we pay a cost for such largess. Lenders insist upon being paid. Hence, when we borrow our national debt puts a drag on our economy. Want some evidence? According to CNSNews.com, we have a Record 92,269,000 Not in Labor Force; Participation Rate Matches 36-Year Low. Because our nation’s unemployment rate is current 6.1 percent (see Hiring dropped in August as economy added 142,000 jobs; unemployment rate at 6.1%), we are suppose to be happy. But the economy is growing too slowly; it’s stagnant. Because the gross domestic product grew by 4.2 percent in the second quarter of this year, some crowed happily about that. Yet in the first quarter of this year, the economy shrank by 2.1 percent (U.S. GDP Grew 4.2% In The Second Quarter 2014, Up From Prior Estimate). So while this growth is better than the alternative, a booming economy it ain’t. So what is the labor force participation rate? Unlike the unemployment rate, the labor force participation rate considers people who could work, but these people have either given up looking for work or don’t want to work. The Unemployment Rate: Get Real explains why the difference is important. Who have given up looking for work. 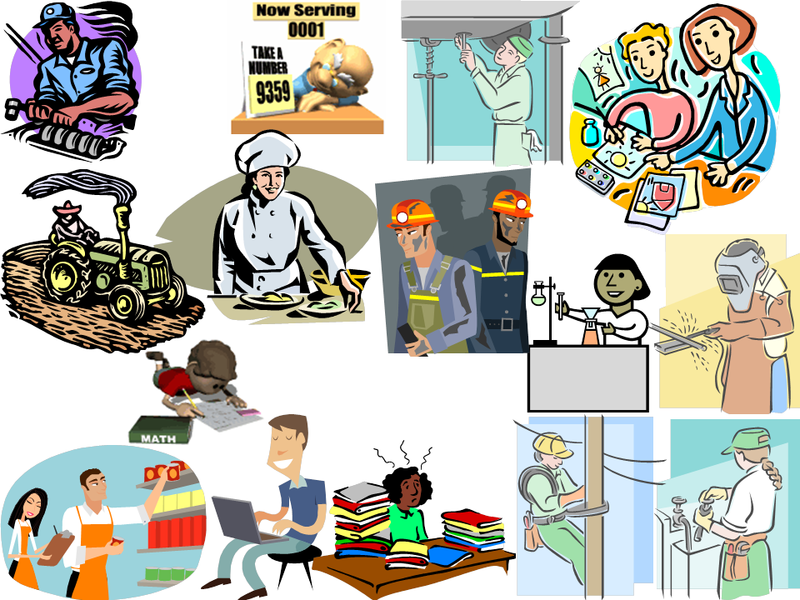 Who are underemployed (working part-time, for example). With temporary problems that prevent them from seeking work. Thus, the unemployment rate glosses over the fact that many Americans who should be working don’t have a job. Why are so many not working? Is it as this post suggests, politicians promising to much? Here are a bunch of articles that offer different viewpoints. Read them and judge for yourself. Just keep the Bible passage that follows those articles in mind. Idleness is not good for us. What was the first thing God did for Adam? Did He give him a wife in marriage? No. He gave Adam a job (Genesis 2:15). 6 But we command you, brethren, in the name of our Lord Jesus Christ, that you withdraw from every brother who walks disorderly and not according to the tradition which he received from us. 7 For you yourselves know how you ought to follow us, for we were not disorderly among you; 8 nor did we eat anyone’s bread free of charge, but worked with labor and toil night and day, that we might not be a burden to any of you, 9 not because we do not have authority, but to make ourselves an example of how you should follow us. 10 For even when we were with you, we commanded you this: If anyone will not work, neither shall he eat. 11 For we hear that there are some who walk among you in a disorderly manner, not working at all, but are busybodies. 12 Now those who are such we command and exhort through our Lord Jesus Christ that they work in quietness and eat their own bread. This entry was posted in Citizen Responsibilities, Constitutional Government, religion and tagged Bible, Economy, prince william county, Prince William County Virginia, religion. Bookmark the permalink.